Preston and his mom, Carrie, can be found at www.thingstodofamily.com. Preston is a precocious toddler who writes about ducks, bananas, and tick-tocks. Carrie works full-time, parents full-time, and blogs and crafts for fun. Together with Daddy/husband, John, they keep a journal of the life of a toddler from different points of view. You can follow Carrie on twitter @carriedbyme and visit the site of her blossoming business www.cherrylndesigns.com. When you have a Daddy with a nickname like “Technical John” you can’t always expect to do regular father/son activities. Sure we play ball, build brio layouts, and read stories about trucks and ducks. But if I’m stuck with Daddy when he is in the middle of a project, some strange things happen! This one time Daddy was redoing the sound system in our home theatre. Mom and I aren’t really sure what is involved, except that a lot of wires and big heavy boxes get moved around. He was in there for hours – in his own world. When he finally took a break, Mom and I needed a break from each other, too. So she asked Daddy to read me a story. Let me tell you it was the strangest story I’ve ever been read. It was called “Onkyo” and had really weird pictures. It was also way too long for me, so we’ll have to try finish it another night. Sometimes Daddy has to go away overnight for his job. If the universe aligns I can look at Daddy on the computer before I go to bed. It’s not really him, but somehow I can play with him and talk to him! Mommy calls it “Skyping.” Daddy and I can play all of our favorite games through the computer, too! He likes to draw pictures for me and then hold them up for me to guess what they are. He also plays “Peek-a-boo,” and we make silly faces at each other. 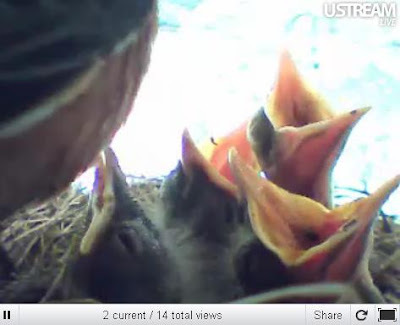 One time, Daddy used a camera so that we could "Skype" with/spy on some baby birdies! Their Mommy built them a nest on our patio speaker. 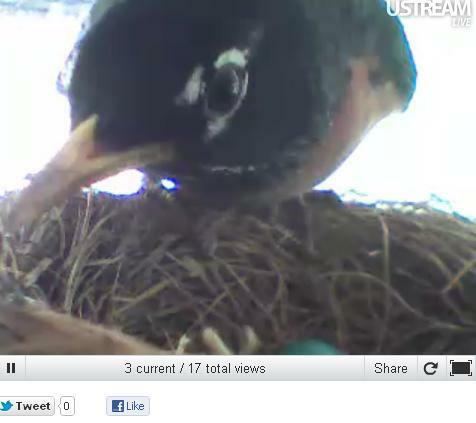 We watched as they hatched, begged for worms, got super fluffy, and then flew away. It was a really fun project! Daddy and I also LOVE to play the piano together and sing! Mommy sings with us, too, sometimes. And we dance! Family dance parties are the best. When I play the piano with Daddy he lets me pick the song. When I get tired of the song he is playing I turn the page to let him know it’s time to move on. I also like to get on the floor and push the pedals on the piano; Daddy has to get his feet out of the way. What silly things do you do with your Daddy?